Back in February, Jonathan ‘JJ’ McPhillips was stabbed to death outside Islington Town Hall. He was just 28 years old, leaving a wife and two daughters. His family and friends created this memorial in Milner Square, close to his home. I think of street memorials as a relatively recent phenomenon. When I first started noticing them they were usually in the form of a bunch of flowers left by a roadside, marking the spot of a traffic accident. Lately I’ve noticed a few memorials like Mr McPhillips’, where it’s the life and not the place of death that’s marked. These spontaneous acts of remembrance for the ordinary people of a city seem to me to be qualitatively different from the celebrity street memorials that have also become part of our culture. The first of those I can remember, and perhaps the strangest, was Princess Diana’s. Thousands of people leaving thousands of bouquets for a famous yet mysterious woman whose death had affected them in some deep and inexplicable way. I couldn’t feel it or understand it. Was that before or after the roadside memorials became commonplace? Whatever the chronology, the celebrity versions, prompted by adoration from a distance, refracted through myth, are quasi-religious, more like shrines than remembrances. There is an odd neediness about those who gather at them, a desire to participate in a tragedy that is not really theirs. The street memorials that mark ‘ordinary’ lives possess an intimacy and a personal knowledge that is absent from the celebrity kind, precisely because they are the creation of those who knew and loved. 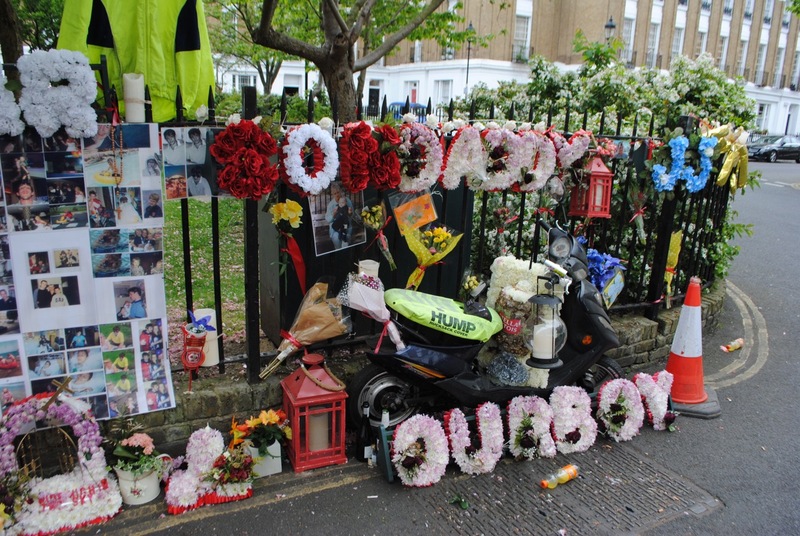 But whatever the impulse, whatever the degree of separation, street memorials have become a vibrant kind of folk art and this one in Milner Square is a rich and exuberant example: flowers, candles and photographs, of course, but also a crutch, a motor scooter, and Stella bottles. It is an intrusion of love into a public square, the imprint of a known life on the cityscape, however impermanent.